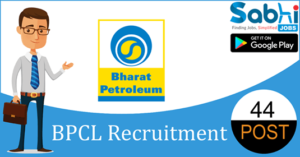 BPCL recruitment 2018-19 notification has been released on official website www.bharatpetroleum.com for the recruitment of 44 vacancies at Bharat Petroleum Corporation Limited. The candidate who is looking for General Workman-B (Chemical, Mechanical, Instrumentation) can apply online application from 28th May 2018 and before 11th June 2018. Qualification First Class Diploma in Chemical/ Mechanical/ Instrument Technology/ Instrumentation & Control/ Electronics & Instrumentation Engineering/ Technology (Full time course approved by AICTE) with 60% marks from a recognized Indian University/ Institute. Selection Process Selection will be based on Written Test, Skill Test and Pre-Employment Medical Test. How to Apply Interested candidates may apply online at BPCL’s website www.bharatpetroleum.com from 28th May 2018 to 11th June 2018. 1. Candidates are required to carefully read the detailed advertisement and ensure that they meet the prescribed eligibility criteria before applying for the above posts. For all purposes, interpretation as per English version of the advertisement shall prevail. 2. Reservation/Relaxation/Concession for SC / OBC (Non-Creamy Layer-NCL)/ ExServicemen / PwBD / J&K domicile candidates will be as per applicable presidential directives/Govt. directives on the subject issued from time to time. 3. For claiming reservation/relaxation benefit of OBC (NCL) category, the candidate should submit a valid community certificate from Tahsildar or other competent authority (which should not be more than 6 months old from the last date of submission of application) in the proforma prescribed by the Govt. of India, which would, among others, specifically mention that the candidate does not belong to the persons/sections (creamy layer) as mentioned in column 3 of the schedule to the Dept. of Personnel & training in the Govt. of India OM No.36012/22/93- Estt. (SCT) dated 08.09.1993. Candidates belonging to OBC category but falling in Creamy Layer are not entitled to OBC reservation/relaxation benefits. Accordingly such candidates may choose to apply for the positions provided they meet the age criterion applicable to general candidates and indicate their category as “UR”. BPCL being a Central Public Sector Undertaking, only those communities that are mentioned in the common list of OBC approved by Central Goveent shall be treated as OBC for the purpose of reservation. 4. Candidate seeking reservation/relaxation/concession as applicable SC/OBC (NCL), will have to submit the caste/community certificate in the prescribed format by the designated Competent Authority meant for appointment to posts under the Govt. of India indicating clearly the caste, the Act/Order under which the caste/community is recognized as SC / OBC (NCL) and the Village / Town the candidate is ordinarily resident of. 5. SC/OBC candidates applying against un-reserved posts shall be considered against general standards and no relaxation in age, qualification cut-off marks, selection process cut-off marks etc. shall be extended to them. 6. Persons with Benchmark Disabilities can also apply for the above posts in accordance with provision of para 25 of DOP & T OM No.36035/3/2004 – Estt. (Res) dated 29/12/2005. Persons with Benchmark Disabilities (PwBD) are persons with permanent disability of 40% and above. PwBD candidates are required to submit a certificate issued by a medical board with a minimum of three members constituted by Central/State government failing which their candidature as PwBD candidates will not be considered. 7. Wherever CGPA or Grade is awarded in the Diploma examination, its equivalent percentage of marks must be indicated in the application form as per the norms adopted by the applicable Board/Institute/University. 8. Candidates currently employed in Govt. / Semi-Govt. / PSU will have to produce ‘No Objection Certificate’ at the time of Skill Test and ‘Relieving Order’ from their employers at the time of joining. In case the candidate fails to do so, his candidature will not be considered. 9. Candidates sponsored by Employment Exchange are required to submit online application. 10. Candidates domiciled in the state of Kerala will be preferred. 11. Everything else being equal, preference will be given to erstwhile Kochi Refinery Project Evictees. 12. Outstation SC / ST / PwBD candidates attending the Written test / Skill test are eligible for to & fro Sleeper Class train fare / Non-AC bus fare for the self, by the shortest route, from the nearest available bus/railway station from the mailing address of the candidate as mentioned in the application form on submission of original tickets, provided the distance is not less than 30 kms from the venue of Stage 1 or Stage 2 tests, as per rules. The reimbursement will be made through Bank. 13. Candidates belonging to SC/ST/PwBD should bring their original caste certificate/ disability certificate along with a photocopy of the same to claim travel reimbursement. 14. Candidates have to make their own arrangement for lodging and boarding for appearing in tests for any stage of selection process. 15. Corporation reserves the right to fill OR to partly fill OR not to fill all or any of the above posts without assigning any reason whatsoever. 16. Only male candidates may apply. verification of antecedents/certificates/testimonials. In case it is found/ known at any stage of selection/recruitment process or thereafter that a candidate does not fulfill the eligibility norms and / or that he has furnished any incorrect/misleading / false information / certificate / documents or has suppressed any material fact(s), his candidature will stand cancelled. If any of the information or material particulars as furnished by the candidate to the Corporation are found to be untrue, inaccurate or incorrect at any stage before or after his selection, then the same shall amount to misrepresentation/ fraud and his services shall be liable to be terminated unilaterally by the Corporation, at any time. 18. The decision of Corporation will be final and binding on all candidates on all matters relating to eligibility, acceptance or rejection of the applications, mode of selection and cancellation of the selection process either in part or full etc. Filling up of the posts is solely at the discretion of the Corporation and also subject to the suitability of candidates & Corporation’s requirement and no claim will arise for selection. Corporation reserves the right to call only those candidates for various stages of selection process who in its opinion are likely to be suitable. Corporation may at its discretion, alter the minimum eligibility standard/ criteria/cut-off to restrict the number of candidates or to make available sufficient number of candidates to be called for written test or for subsequent stages. No enquiry or correspondence will be entertained in this regard. 19. For any other general queries pertaining to this recruitment advertisement please email to bpc lk rh r @g ma il. c om . Correspondence/Communication in any other manner will not be entertained. Candidates are advised to mention their application number in the subject of the mail while corresponding on any information/query related to this recruitment notification and related details. Candidates are also advised to mention their correct e-mail ids and contact no. /mobile number (10 digits) and keep checking their e-mail messages. Corporation shall not be responsible for any delay or non-delivery of messages in the email ID, either on account of incorrect entry in the online application or networks issues. 20. Any Corrigendum/Addendum etc. with regard to this advertisement will be made available on www.bharatpetroleum.com>Careers only. Candidates are advised to regularly visit our a b o v e website for updates about the recruitment process or for any communication on dates/corrigendum/addendum/other modalities. Post notification all the correspondence would be through website/e-mail only. 21. Court of jurisdiction, for any dispute will be at Kochi. 22. Mere selection in Written Test or Skill Test or empanelment after the selection process shall not confer any right of appointment to the applicants. 23. Canvassing in any form will be considered as a disqualification. be allowed at any stage after making online application. If any information is found incorrect/ erroneous at any stage of recruitment process the candidature of the candidate can be rejected. 25. Candidates of all categories including ex-servicemen who will be offered appointment against this advertisement, need to join within 30 days of offer. BPCL shall have the full discretion to reject the candidature of any candidate who does not join within the prescribed period. 26. If any candidate acquires higher professional qualification or such equivalent/ similar qualification after making application but before the appointment process is over, his candidature will not be considered. 27. Corporation reserves the right to change/ modify/ cancel/ amend the selection/ recruitment process or procedure thereof at its sole discretion without assigning any reason. Decision of the Corporation on any such matters would be final. 28. The tentative date of the written test will be during the last week of June/first week of July, 2018.